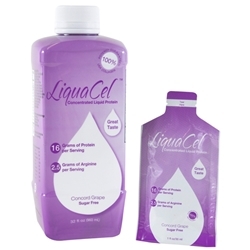 Attention Dysphagia Patients: LiquaCel® Liquid Protein is considered a Nectar Thick liquid. LiquaCel™ is a superb tasting source of protein that contains 16 grams of protein and 2.5 grams of arginine per 1 oz. LiquaCel™ is a perfect alternative for large volume supplements that are difficult to consume. Contains all essential and nonessential amino acids. 1 oz. 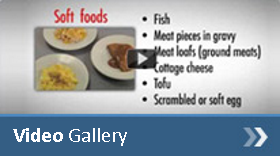 serving offers 16 grams of protein and 2.5 grams of Arginine. Can be given orally or enterally. No refrigeration required. Sugar-free and safe for everyone. Ingredients: Proprietary Protein Blend (Hydrolyzed Kosher Collagen Protein, L-Arginine, and Whey Protein Isolate), Filtered Water, Glycerin, Tartaric Acid, Malic Acid, Natural Flavor, Potassium Sorbate and Sodium Benzoate (to preserve freshness), Sucralose, Red 40, Neotame, Blue 1.